“As God as my witness, I thought Turkeys could fly.” If you are in the 50-60 year old range, you probably recognize that quote instantly and remember with admiration for one of the truly funny sitcoms of the era – WKRP in Cincinnati. A time when I could sit down, enjoy a bit of TV and laugh a little for 30 minutes – now, not so much. Have a wonderful holiday wherever you might be, stay safe in your travels and enjoy today’s timely feature of Turkeys that CAN fly (a bit at least ha). This particular Tom Turkey was an unexpected surprise. Linda and I had stopped to take pictures of a Great Horned Owl in Rocky Mountain National Park back in May 2014. You might recall, we were able to get some shots of both the mother and her Owlets (link here). I had moved to a location up on a hill allowing me to shoot almost directly into the pine tree they were nesting in and yet still far enough away that there were no unwarranted concerns by any of the subjects – somewhat aided by the fact I was shooting from behind a large boulder on top of the hill. So caught up in shooting the owls, I didn’t even notice this dude come walking up behind me. 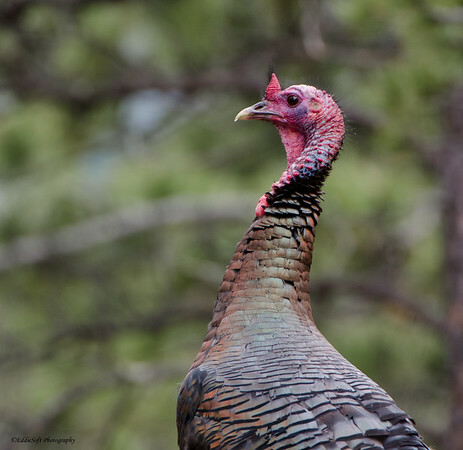 In honor of today, hit the jump to see a few more pictures and read a bit more about the Wild Turkey. I turned around to make sure there were no Bears or other hazardous wildlife lurking about (having noticed some Elk tracks while walking up there and having already witnessed Bears at other locations in the park). No Bears, no Elk, no Badgers no…. whoa, what is that! I couldn’t believe two large Wild Turkeys were just strutting by with very little concern for me (it is possible they didn’t see me either). Already had eaten up a good chunk of my SD card on the Owls, so quickly turned my attention to finally getting decent shots of a Turkey. Had plenty of encounters before (link here and here), just not very good execution on the pictures. This are not perfect by any means, but clearly a step in the right direction. Turns out these Turkeys are a lot faster than I had assumed. By time I had the settings dialed in, they were well past me and starting to head down out from the clearing. Guessing by then they were alerted to my presence because they were keeping one eye on me whenever they stopped to peck at the ground. I slid down the hill parallel to them in hopes of setting up ahead of them and simply waiting for them to come into view again. The trees were causing a bit of a problem for me. They, on the other hand, thought it was great cover from whatever human with the giant camera they had spotted earlier. It ended up working out for me. They luckily came on the near side of a pine tree giving me a chance to get some snaps in the tin. Lost some light thanks to being deeper in forest – still able to pull out the brilliant colors these birds possess. Even the blue/green shimmer in their wing feathers came out decent. 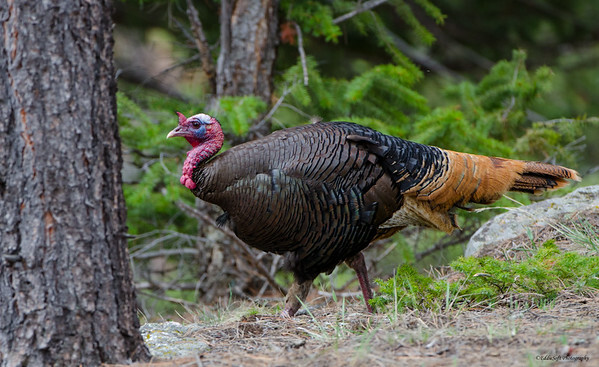 Thanks to Cornell’s fine birding site, learned that you can distinguish Rocky Mountain Wild Turkey’s from other regions by their whitish tips to the rump and tail feathers, whereas other populations have rusty or chestnut tail tips. I found this very interesting in the fact I was actually in the Rocky Mountains on this encounter yet, these particular specimens did not sport the white tips. Maybe they were just visiting family. Note, you can just see the beard on the chest coming in. The wattles are the red masses under the beak and I am guessing a bit, but I think that is the snoot sticking up above the beak. Typically I see it when it is gorged with blood and hanging off the beak – this is the first I have seen it sticking up like that, however, I may be wrong on that identification. Also learned they are part of the Pheasant family – something new every day. 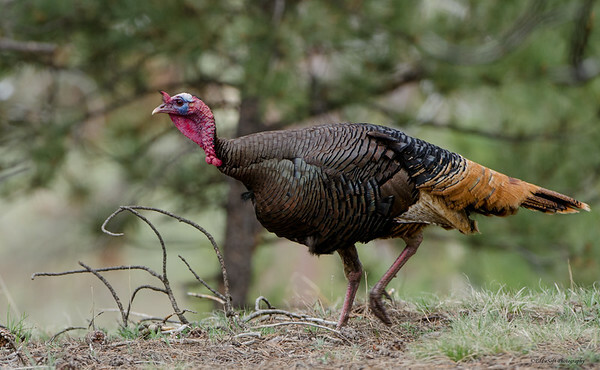 Let’s hope these Turkeys spotted back in 2014 are still enjoying the Rocky Mountain air to this day – a better fate than most of their domestic brethren are facing on this particular day. Enjoy the holidays everyone and be thankful we have the opportunity to enjoy these beautiful creatures in the wild. 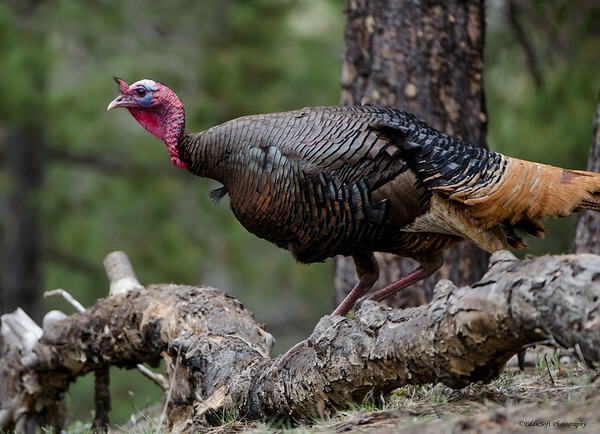 These are very nice Turkey pics! Better than my first one at Chain O’ Lakes. 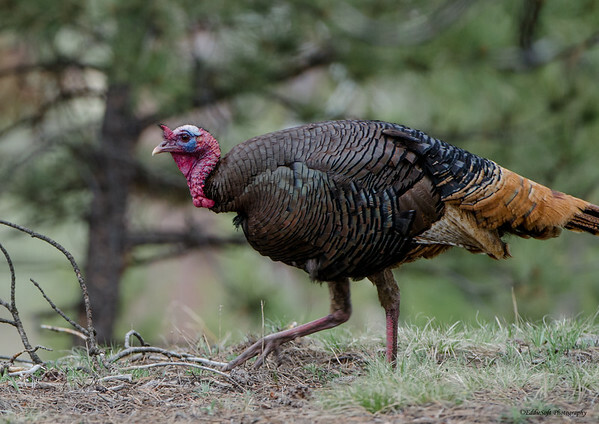 Perhaps they were not Rocky Mountain turkeys but were on the lam, hiding from the Butterball corporation henchmen. You didn’t see any females? Are you sure that was even a Turkey you took at Chain O’ Lakes – looked more like a pterodactyl or maybe a Yeti (hehehe). There were no females around which was also a bit odd – I am still in the hunt for the elusive fan-tailed shot of the Turkey, but at least I have a decent shot of one to add to my Birding List. I had no idea WKRP was hampered by the song royalties – a number of years back I went ahead and bought all the seasons on DVD – second only to the Turkey episode, the one where Venus and Johnny are doing the drunk response test is absolutely hilarious. Interesting enough, if that show was still on today, guessing the secretary jokes wouldn’t be welcome.